Outcomes: Participants will . . . Format: This is an intense two-day workshop that cuts through the mystique surrounding Executive Presence. 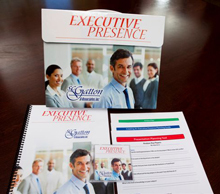 It focuses on building an awareness of the Executive Presence dimensions, gathering insight into reputation management, creating a strong network of strategic alliances, uncovering ways to increase organizational savvy, understanding clothing choices that enhance an executive image, and discovering the nuances of social acumen. It also zeros in on advanced communication skills and creates an Executive Voice that projects a high degree of competence along with confidence. Option 1: One-on-one coaching sessions with each participant after the workshop. Option 2: 360° feedback that assesses how others perceive each participant’s level of competency on the six dimensions of Executive Presence. One and One-Half-Day Workshop Format: This highly informative and engaging workshop boosts performance while creating a memorable positive impression with senior managers and executive clients. Typically, sales training focuses on the sales cycle, product features and benefits, and methods of making effective sales presentations. This workshop focuses on understanding the power of Executive Presence—image, social and business acumen, language choices, diplomacy, authenticity and persuasiveness. Topics and insights rarely discussed in sales courses. Once understood, these insights help sales professionals out-perform their competition. One-on-one coaching sessions with each workshop attendee. One-day Workshop Format: This high-energy, content rich workshop takes the guesswork out of creating an image that speaks to the level of professionalism as well as the capabilities an individual brings to the job. It takes a look behind the scenes to discover how certain actions, word choices and even selection of clothes adds or detracts to how others form their perceptions. With just a few tips individuals improve their ability to project successful personas. One-on-one coaching sessions with each of the workshop attendees. Format of Workshop: These advanced techniques build upon a foundation of basic presentation skills by challenging participants to take an in-depth look at the most impactful way of reaching their audience. This involves developing a clear understanding of how to align their message with their listeners’ expectations. The format involves each participant doing five presentations. All of them are videotaped and critiqued in private. As the workshop develops, the level of difficulty for each presentation increases. Each participant receives immediate feedback on how to improve their presentation techniques. The videotape is used to reinforce the acquired skills.